Meets ANSI A117, 1-1986 providing accessibility and usability for physically handicapped people. High-density polyethylene station with large, high-efficiency rubber spray heads. 21-gallon capacity. Sprays for up to 15 minutes. Wall-mounting hardware included. Meets ANSI Z358. 1. Color: blue. IN STOCK. Self-contained units provide instant protection in emergency situations. 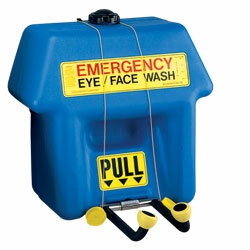 Designed for use near potential hazard areas lacking water supplies. No plumbing hookup is required. XA-1015 Wt. 15 lbs. 26"Wx12"Dx24"H.